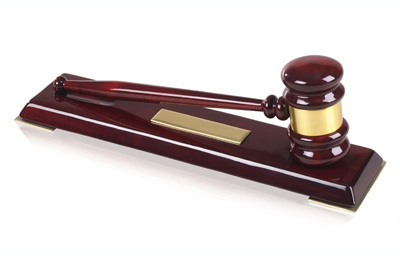 Individual gavels, gavels with sound blocks or complete presentation sets are available. Sizes include 8", 10", 10.5" and 11" gavels. Gavels also are available in walnut, piano finish, gold, silver, copper and brass. Colors for holders are matt black, sliver and yellow gold. Face of signs come in a multitude of colors. Signs for doors, walls and desks. 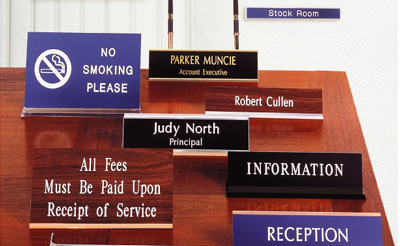 Name badges - available in custom sizes, a wide variety of colors and heavier logo included. While ready-made (pre-designed) stamps may be suitable for most of your needs, you will find that many of our pre-designed stamps can also be personalized. Of course, if you don't see exactly what you're looking for in our online rubber stamp merchandise, please rest assured that a custom design can be made to your specification. 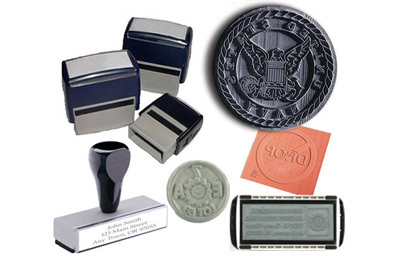 Company logos or other graphics can be incorporated into the rubber stamp design.